Linux is 2nd most prominent Operating System (OS) in the world after Windows. While its user base is less than exciting in the PC arena, everywhere else, it is a behemoth. Over 90% supercomputers are using Linux and as Android is essentially Linux, most of the smartphones are also running on Linux. Despite this, there are two major problems with Linux. One is that it is not close to a normal user. Supercomputers are not used by general public and Android has so many layers that the linux is not really accessible to user. Second issue is that there are so many forks of the OS in the market that anyone who is even interested will have a steep and befuddling climb ahead of him. I have been using linux for many years now and even I have only used the Debian extensions till now. Also, the stigma attached with Linux as being a tough platform to work with has always kept people away from it. Apparently the Linux Foundation understood this problem and have thereby decided to make their course in Basic Linux more accessible to anyone with a decent internet connection. 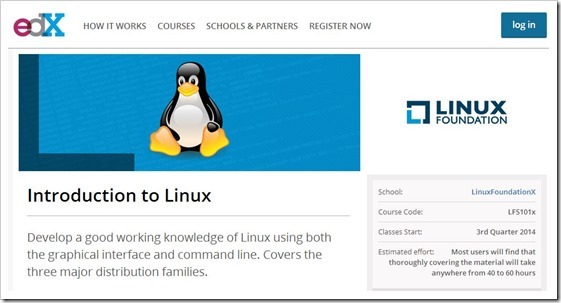 The course “Introduction to Linux” will be offered on edX for free. edX is an e-learning website backed by MIT and Harvard thereby ensuring that the quality and standard of education would not be sacrificed in anyway. The actual price of the course is $2400 (around Rs. 1.5 lakhs) obviously making it prohibitive for most people to take it. Making it free is a giant leap and it might make Linux more interesting for people. The course is around 40-60 hours and people have complete freedom on how they want to study it. People can even simply audit the course if they feel they cannot complete the tests and assignments. This would mean that they still get to watch all the videos. As there is no limit to the number of people who can sign up for the course, there is an expectation of a lot of people starting. In fact, 2500 people signed up in just the first 24 hours of the announcement. Of course, the important thing is how many complete the course. If the course goes well, Linux Foundation might bring its other courses to edX for free as well. Only time will tell how much this move will affect the rise of Linux. In the meantime, if you are interested in joining the course, here is the link.